The main exhibition concept of the group show "Blacklight" is to turn a 300 square meter basement into a dark void/space. This simple situation forces the involved works to deal with darkness as a basic physical and perceptual condition. The basement is situated behind a door (D1) at the far end of a narrow court yard. From the door there is access to an 2,5 square meter internal landing with stairs leading down into the basement. Under normal circumstances the basement is illuminated by six 500 Watt halogen spots which are turned off during this exhibition. Entrance is a site specific work which consists of a construction of white wooden boards attached to the inside contours of the door creating a narrow room with a floor, two side walls, an end wall and a ceiling. In the end wall six 500 Watts halogen spots are fixed corresponding to the normal lighting in the basement. In one of the side walls a door (D2) is attached with a door closer. When a visitor opens the door (D1) from the court yard he/she is confronted with the illumination of 3000 watts from the halogen spots. The light intensity and the reflections on the white surfaces of the room and the heat from the halogen spots is very strong creating an uncomfortable physical situation forcing the visitor to either leave through door D1 or enter through door D2 into the basement. When entering door D2 the visitor enters the dark void of the basement. Due to the high light intensity in the entrance room the pupils of the visitor's eyes contracts to adjust to the extreme light level and at the same time dark spots appear on the retina. When opening the door (D2) to the basement area the physical condition of the eyes creates a temporary perceptual disruption in the visitors attempt to perceive and navigate in the basement. Film footage / duration 44 sec. 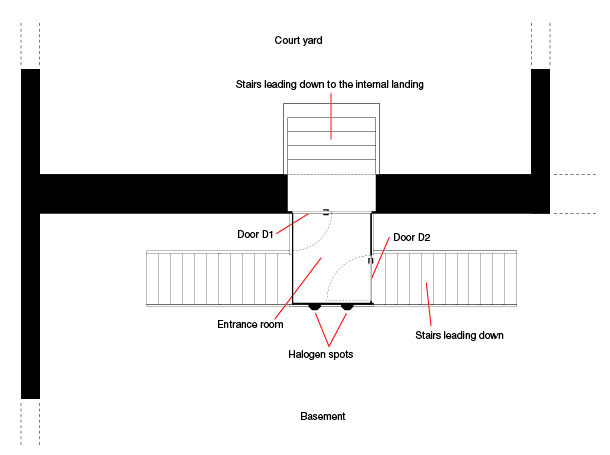 The layout discloses the position of the entrance room and the adjoining court yard and the basement area.